What is a screen? What can it be? This post looks at the embodiment of the screen as a function of dimension, and presents a rapid survey of all types of screen — past, present, and future — in hopes to begin a dialogue about the objects that convey information into our world. Conventional definitions of the screen are limited to examples of now-ubiquitous devices, namely LCDs (the kind used in most TVs, monitors, and mobile devices), CRTs (those old, heavy monitors), and projection surfaces. Screens are more than that, though: in their most basic purpose, they’re ways to convey information, variable information, almost always with light. Take that video (and its matching book) with a grain of salt, but I think the first few dimensions (at least up through four), are good explanations. As a summation: the zeroth dimension is a point, the first is a line, the second: a plane, the third: a cube, and the fourth: the entire life of a cube. In the land of screens, a single point is an LED. 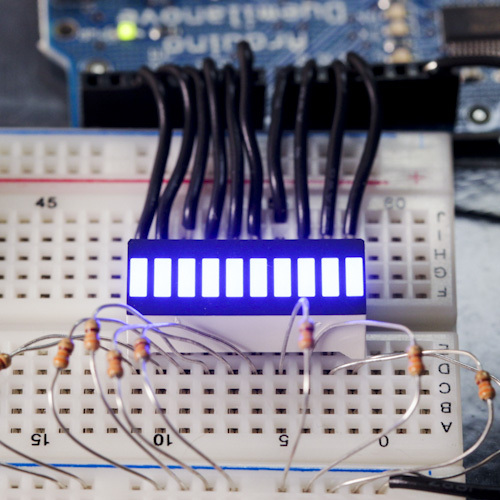 LED’s, although seemingly bland, actually can convey a ton of information. With simple digital signals, i.e., 1 or 0, “On” or “Off”, an LED can describe power states, charging status, data transmission, etc. With some Pulse-width modulation (PWM), LEDs can vary their brightness to add another virtual dimension to their physical existence. Combining three different colors in one housing yields an RGB LED, able to shine in any hue of the (24-bit) rainbow. A single LED can be viewed as a single, tangible pixel. Single-LEDs have become so ubiquitous that their use has become default literature in many developer platforms: The Android Material Design Stylebook ensures that phone devs take care in using built-in notification LEDs that align with user preferences. A handful of apps have even been developed to allow users to customize those alerts to their liking. Within the maker community, the popular Arduino platform includes, as its default “Hello, World!”-type sketch, built-in examples on programming and building circuits with LEDs. Beams of electrons are shot at the rear of the screen surface, their direction controlled by magnets. Only one point (well, three, if you’re doing color) is ever displayed on the surface, but because of the speed (and slow decay of the glowing phosphors), your mind thinks the whole display is lit up up. Scanning the beam from left to right and up to down nets you a rasterized image, but CRTs can also be used as real vector displays, tracing the outlines of individual objects. CRTs went the way of the VCR for a number of reasons, chief among them sheer weight as they approached the (enormous) size necessary to support ever-increasing resolutions. With the death of the CRT came the death of the vector display (I, for one, would love to see a reemergence). Also between 0 and 2 lies 1, the first-dimension: a line. One-dimensional screens include LED bar graphs and LED strips — essentially single rows of pixels in one housing. Each pixel/segment of the display can be addressable, allowing for fine control of everything independently. Bargraph LEDs haven't been used extensively as single units; you may remember one famous one though, Kitt, from Nightrider. Addressable LED strips have found a place in architectural lighting (where they're not used particularly innovatively), but also as dynamic backlighting for televisions and monitors. Immediately, one might think of a line-screen also as being Tron-like EL-wires, or neon tubes. They’re more than simple 1-D screens because they can bend around the the second (and even third) dimensions, but these things can’t convey variable information on their own; at least not any more than a zero-dimensional single-LED screen — they’re either on or off. But what happens when multiple one-dimensional screens are layered? Complex neon signs and Nixie tubes are great implementations of this: ways to convey discrete varieties of non-static information. Nixie tubes are particularly interesting, as they’ve made somewhat of a resurgence in the past decade or so, after being phased out by the cheaper and more robust 7-segment Displays in the 1970s. Used mainly in clocks and watches today as cool-albeit-gimmicky centerpieces, they once took the place of 7-segments anywhere a numeric display (and sometimes even alphanumeric displays, as some Nixies could even display letters as well), was needed: calculators, elevators, stock tickers, you name it. What if we take multiple one-dimensional screens and lay them next to each other, instead of on layered? A Rubens' tube, if you didn't watch the movie, is a visualization device that displays standing sound waves, with fire. Similar uni-dimensional array screens like the Nixie and EL bargraph displays above also demonstrate similar effects, albeit with electricity instead of combustion. These One+D arrays are pretty much only used in applications where signals must be deciphered, usually sound waves through basic waveforms or FFT analysis. What if the plus of One+D wasn’t bridging the first and second dimensions, but the first and fourth? SpokePOV (and it’s sibling MiniPOV) — open-source projects from online electronics retailer Adafruit — also live within the 1+D world. They utilize something called the Persistence of vision effect (hence the POV) — your eyes don’t refresh the scene they see instantaneously; instead, they retain an after image for about 1/25th of a second. This is how movies appear to be fluid, even though they sometime only show 24 images per frame, and how the CRT displays from above can project a single pixel at a time, but make it seem like the whole display is illuminated. SpokePOV uses this technique to turn a bicycle wheel into a POV display, by lighting up a line of single LEDs in a controlled fashion, and spinning the array so rapidly that you can no longer discern individual lights. This one’s easy: pixels. It’s where most of our world is today. As cool as it all is, it’s kind of boring. Most of these technologies are already part of the zeitgeist, so I won't delve into detail here. The Two-D screen world is composed of flat rectangles; sometimes we can see through them, sometimes we can bend them, and sometimes they're not rectangles. There are many technologies in this field, new and old, and for better or worse, many of them will be absolutely revolutionary in terms of shaping the future. Between Two-D and Three-D are pixels in space. Prepare for some videos. From the Tangible Media Group at the MIT Media Lab, Relief displays combine actuated pixels with a projector and motion tracking. This technology combines light, three-dimensional depth, and interaction to create a more tactile and tangible display. A Water Drop Display, coming out of the CMU Illumination & Imaging Laboratory, utilizes precisely controlled droplets and in-sync projector-mapping to make a 2.5D display made from sheets of water. My own work, LAYERd, is a multi-layer display that aims to create a parallax-type 3D screen, as well as a new type of user interface that takes into account discrete physical depths. Faux-3D effects, like drop shadows and parallax motion are unnecessary here, because the screen’s pixels exist in space. Microsoft Research is utilizing a wedge-shaped lens (dubbed "the Wedge") to allow for computer-vision opportunities in displays by being able to capture images of viewers directly from the screen surface, as opposed to from a camera capturing viewers from a different perspective than what the screen "sees". At Disney Research, there's been some development into creating 3D-printed displays out of optical plastic (essentially 3D-printed fiber optics or light pipes). The light source can be kept at a distance from the final output of the pixels, and like many of the other screens in this category, can be combined with tangible aspects like motion tracking and touch sensing. Not just limited to the 2+D realm though, Disney's 3D-printed displays obviously can break into true 3-D (see the light bulb, for example). Like the 2-D screen space, most of the 3-D space is largely known by the general public (maybe not quite as much) — 3D TVs, holograms, virtual reality head-mounted-displays, etc. — but there are a few stand-out technologies that bear exploration here. Holografika's HoloVizio is being billed as a Voxel display — Voxels are essentially 3-dimensional pixels; the raster building blocks of a 3-D world. The more correct terminology, however, would be a light-field display. Light fields, in simpler terms than a Wikipedia article can produce, are analogous to the images captured by a standard camera. Instead of seeing the scene from a single point in space, light fields capture the scene from thousands of points in space. Each pixel of a 2D image contains information just on the color of light in that part of the scene, but each sub-image of a light field contains the direction of the individual light rays in the scene. That essentially translates in the ability to display 3-dimensional images. Tensor Displays, from the Media Lab’s Camera Culture group, also utilize light fields. Using directional backlights and multiple layered transparent LCD panels, a much higher resolution glasses-free 3D than other technologies can be accomplished. These are what are known as compressive displays: multiple light rays are compressed into single pixels, and displayed one at a time, quickly. Aerial Burton can create true three-dimensional images in the air by ionizing air molecules with a laser (similar to how lightning illuminates the sky). The technology can only produce extremely low-resolution images at the moment. The inFORM display, again from the Tangible Media Group, uses more actuated pixels to create an interactive display that can act as a string-can-telephone type of thing — physical tele-communication between disjoint individuals — or a physical visualizer/manipulator/creator of virtual models. With all of these new technologies, which ones will stay, and which will go? My guess is that it will depend (or more likely, be co-dependent) on content being produced. Brian David Johnson, Intel's chief Futurist envisions more content, ubiquity, personalization (like the web is starting to do), perpetuation of social aspects, like personalized “TV” channels, as explained later by Anthony Rose in this similar video on the future of television from Intel. Speaking of ubiquity, author, technology specialist, co-founder of Wired magazine Kevin Kelly has a vision of the screen's future. To paraphrase him: we’ve been people of the book. Written word used to the focus of our culture, but now as we become people of the screen, the once immutable truths created by an author's hand on paper no longer apply. As screens become cheaper and easier to produce, we will begin to cover every flat surface (and even non-flat surfaces) with them. The intangible world of information will be made tangible through a melding of the physical and digital worlds. Kelly goes on to explain some specific technologies he envisions: We can make screens as flexible and thin as paper, then bind sheaths of them into a magical book that could change its contents with the press of a button. [Much like the work being done with Microsoft's Wedge] screens can watch us, as we watch them. They can watch where and when we look at them, and use our mood or attentiveness to change content and their form accordingly. Where do I see the future of the screen? I'm not so sure. Like all things, I imagine it will be a combination of the highly one-sided views above, a hybrid world where tangible pixels co-exist with transparent touchscreen windows. The technologies that will prevail may have not even been invented yet. Like Johnson, I do believe that world and the technology that creates it will be formed by the content created for it. Like Kelly, I think screens will become universally ubiquitous, even to the point where every square inch of surface (maybe even the space between surfaces) can display information. I'm sure that in the coming years we will see a variety of technologies arrive to market that begin to break down the barrier between the world behind the screen, and the world in front.